There are few things that I enjoy as much as feeling the sun on my skin. I’m the happiest when it’s hot and sunny and could easily live in eternal summer. Besides being a huge mood booster, the sun is a great source of vitamin D which is essential for our health. According to Dr. Mercola there are about 30,000 genes in our body and vitamin D affects nearly 3,000 of them. Sufficient vitamin D levels help maintain optimal health and protect us against many diseases. Sun exposure is the best way to get your vitamin D intake. To enjoy the sun as much as possible, I love using this homemade coconut oil zinc oxide sunscreen with carrot seed oil. · Limit your time in the sun to the early morning and late afternoon when the sun isn’t at its strongest. · Build up sun exposure gradually so that your skin can get used to it. · Know your skin type and adjust your sun exposure accordingly. · Protect sensitive body parts by using safe sunscreen and wearing a hat. · Drink enough water to stay hydrated. Most of us are familiar with these guidelines, but when it comes to sunscreen there is still a lot of confusion. The problem is that many conventional sunscreens contain toxic ingredients. They don’t just block the UV rays, but can actually be dangerous to your health. This is because they use chemical filters such as oxybenzone and avobenzone which disrupt your hormones. They can cause all sorts of health issues including increasing your risk to develop skin cancer. If you want to learn more about sunscreen, head over to Dr. Mercola’s sunscreen article. He’s great at explaining scientific stuff in a very understandable way and provides links to the research behind it. Luckily it’s not difficult to make sunscreen that protects you and doesn’t contain any questionable toxic ingredients. The key is to look for non-nano zinc oxide, which is a safe ingredient that blocks UVA and UVB light. This homemade coconut oil zinc oxide sunscreen contains just that, plus carrot seed oil and coconut oil, which both offer natural SPF protection. Years ago I discovered sort of randomly that I can use coconut oil for sun protection. I was living in the Middle East at that time and one day I went to the beach with friends. It wasn’t even summer yet, but the sun can be really strong there even in spring time. I had some coconut oil with me and applied a bit on my shoulders and back, but didn’t really take the time to spread it out evenly. In the evening I saw that my back was tanned with in the middle a few long white stripes of my fingers, there where I had applied the coconut oil. It looked very strange and even slightly scary as if some little monster tried to grab me! Most importantly though, I learnt how coconut oil rocks at blocking out the sun. Coconut oil by itself only offers light protection. This is why this homemade coconut oil zinc oxide sunscreen also contains other ingredients such as carrot seed oil. It’s easy to make and pleasant to use. Non-nano zinc oxide is a powdered mineral that blocks sun rays. It doesn’t get absorbed, but stays on top of your skin. It’s a safe ingredient that has been used in sunscreen for many years. Why do you need non-nano zinc oxide and what does it even mean? A nano particle is so small that it is absorbed and ends up in your bloodstream. Some sunscreen brands use regular zinc oxide, since it’s thinner and doesn’t leave a white layer. But this means that it penetrates your skin and you don’t want that! So make sure to always use or buy products with non-nano zinc oxide. Very important. Here are a few things to take into consideration if you’re deciding whether a homemade sunscreen is for you. → The SPF in homemade sunscreen products will generally be an estimate, depending on how much you use of everything. If you want to know exactly how much sun protection you’re getting, you can buy a good organic, natural sunscreen brand. → If you burn easily or plan to be in the sun for extended periods, you might also want to consider using a store-bought natural sunscreen. I can only say what works for myself since I don’t burn easily and am very mindful about my sun exposure. My skin is quite used to the sun, as I lived in tropical climates for over 12 years. I always build up my sun exposure slowly and avoid the hottest times of the day. Keep in mind that every skin type is different. This homemade coconut oil zinc oxide sunscreen is suitable for light to moderate sun exposure for skin that is used to the sun or skin with a naturally darker complexion. Coconut oil has an SPF of minimum 4. Carrot seed oil has an SPF of minimum 35. Shea butter has an SPF of minimum 4. Non-nano zinc oxide has an SPF of minimum 2 and up to 20, depending on how much you use. I don’t know the exact SPF amounts as there are different sources claiming different numbers. 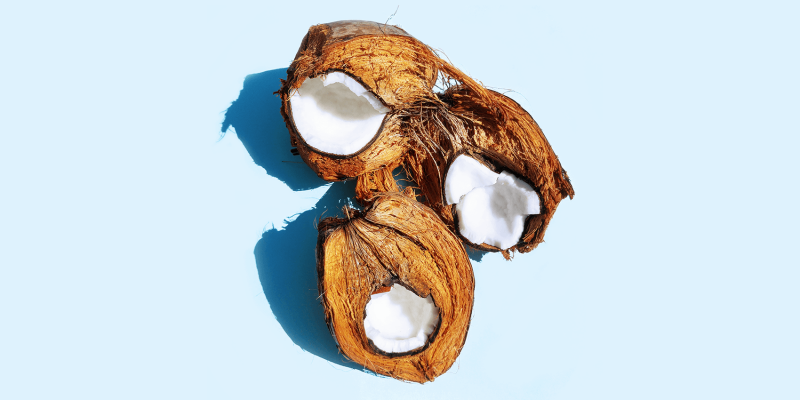 Some say that coconut oil has an SPF of 10. I rather keep the numbers low and give you the minimum. Personally, I use what works for me. I’m less interested in numbers, more in actual results where health and safety come first. A very pleasant ingredient in this sunscreen is vitamin E. It’s a powerful antioxidant which protects against UV damage while moisturizing the skin. Melt the shea butter and coconut oil au bain marie in a bowl placed in a pan with shimmering water on low heat. 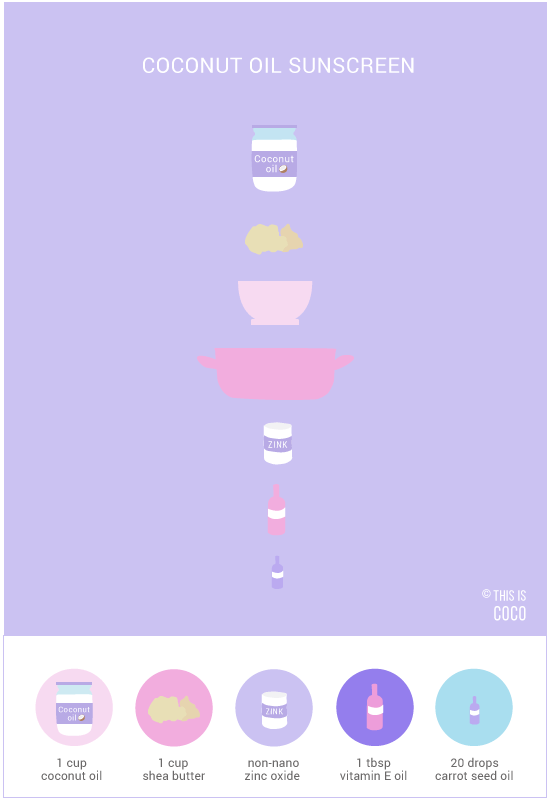 The shea butter needs more time, so melt it first and then add the coconut oil. Once they’re both fully melted, remove the bowl from the heat and let it cool off. Mix in the zinc oxide. Important: make sure not to inhale any of it. You might want to cover your nose and mouth with a mask. Also be careful not to get any of it into your eyes. Once everything is mixed well, pour into a glass jar or container of choice. This recipe is a light formula and turns liquid when it’s hot. If you want to make it thicker, you can add some candelilla wax to it. I personally like a liquid consistency, just make sure you store it in a container that doesn’t leak! Store your homemade coconut oil zinc oxide sunscreen in a cool, dry place or in the fridge. Note: Keep in mind that this sunscreen is not waterproof and needs to be applied regularly, especially when you go swimming or sweat a lot. Read more about my experience with toxin-free living here.